Well, we've come to the end of yet another season of the English or Barclays Premier League - 2015/16. The good side is you'd be once again able to get a table at the mamak stall during the weekends - until the next round of football season, that is. With Man Utd's 3-1 win over AFC Bournemouth, MU has made it to fifth place and a spot in the UEFA Europa League group stages. But until then, Manchester United will play Crystal Palace in the FA Cup final on Saturday. A little from the EPL website about the MU-Bournemouth game..
Wayne Rooney produced his 100th Barclays Premier League goal at Old Trafford before goals by Marcus Rashford and Ashley Young earned Manchester United a 3-1 win in the re-arranged end-of-season fixture with AFC Bournemouth that ensured the Red Devils finished the season in fifth place. The sides reconvened two days on from their scheduled final-day clash which was postponed when a suspicious package was found inside the stadium, prompting its evacuation. 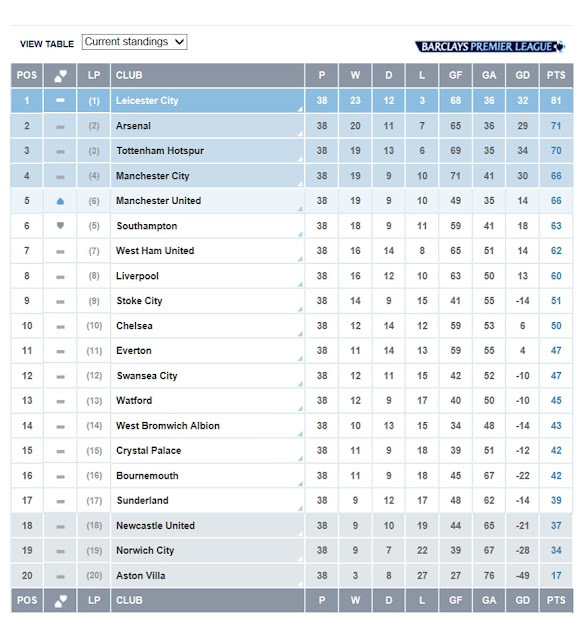 Without further ado, here's the 2015/16 EPL standing after the last game. We'll see relegated Newcastle United, Norwich City and Aston Villa replaced by Burnley, Middlesbrough and Brighton Hull City next season. (Update: Hull City beat Sheffield Wednesday 1-0 in the Championship playoff final at Wembley on Saturday, May 28, thanks to Mohamed Diame's unstoppable long-range shot). Would I do the A to Z Challenge again?